Cranachan is a very traditional Scottish dessert made with a couple of quintessentially Scottish ingredients – oats and whisky. My first introduction to Cranachan was during a burns Night celebration when I was still working and living in London. I had a Scottish friend named Matthew who used to always make this when he entertained, a handful of times a year, and most certainly, on Burns Night. It was his favourite dessert and reminded him of Burns Night celebrations as a child, I used to always enjoy listening to his stories of old. I guess I learnt (by eating) how to make this from him, goodness knows, he made it often enough! Despite its popularity on Burns night, I think this dessert is meant for the summer, after all, raspberries grow like weeds at summertime! Have you tried planting raspberries? They take over everything, sending shoots everywhere! What does Cranachan taste like? The flavour of the whisky is most certainly in the background, it never dictates the play but is quite happy to be cast in a supporting role. The raspberries are definitely the main attraction here, even before you get anywhere near the dessert, their deep red hue draws you in and promises endless bliss. Their sugar-coated tartness hits you with the very first taste and wakes up all your senses but this is quickly tempered by the more laid back nature of the cream, giving you a delightful, multi sensory experience with every mouthful. The oats? Well, the oats provide sweet, contradictory texture that is a welcome side show. There are 4 defining ingredients in this recipe, the aforementioned oats and whisky, as well as cream and raspberries. I know, I know, the idea of oats doesn’t sound too exciting does it, especially if you were subjected to many an oatmeal breakfast while growing up! Personally, I rather like oat porridge! But stay with me and let’s see if we can tantalise your tastebuds as we look at the recipe. Why oats, you might ask. Oats have a long culinary history in Scotland, being better suited to the cold, damp and dark climate than wheat. But more on oats and its history in another post. In the recipe, the pinhead oats are lightly toasted with or without sugar before being used. This adds a lovely, nutty-with-a-touch-of-sweet flavour and a crunchy texture to our dessert. A wonderful contrast. I take this a step further by just using granola, you know those packets of ready toasted crunchy oats that’s great sprinkled on yoghurt? I use the most basic stuff, and just pick the oats, no raisins, no almonds, no tropical fruit; I happily use all those, for a dessert that is not called Cranachan! The traditional recipe calls for the oats to be mixed into the cream. I must tell you, I really, really do not like cream with bits in it! In this instance, the oats end up being neither crunchy nor soft, but a rather sad, insipid component! So what do I do? I sprinkle it in layers and garnish the dessert with it too. It’s a Scottish dessert, it’s gotta be Scottish whisky, although technically, any good one will do. And therein lies the key. Get a good whisky. For 4 people, you only need 4 tablespoons, so if you are not a whisky drinker, get a small bottle. Having said that, there are so many cocktails you can make with whisky; mix it with lemonade, with orange juice or, if you mix some whisky, ginger beer and maple syrup, you get a Canadian drink called Beacon Hill Buck. 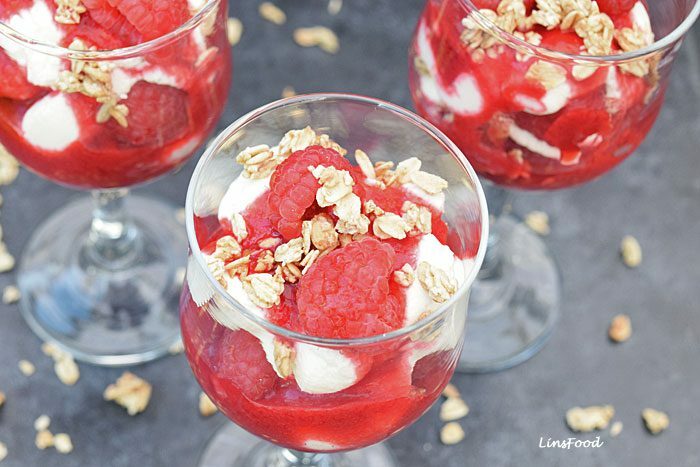 Raspberries are synonymous with Cranachan, which, as mentioned, makes this the perfect summer dessert. This day and age though, we can find so many fruit and vegetables around the year, if you do this out of season, and of course, there is always the frozen option. You can always also use strawberries but the result will not be Cranachan. You want to use cream that can be whipped up, as we want a little shape in the cream, as we fill the glasses up. 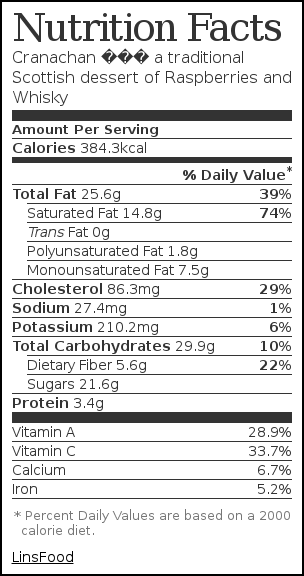 So you are looking for cream with a minimum 30% fat content, 40% is better. Here in the UK, we use double cream for that, in the US, I believe that it’s called Whipping Cream or Heavy Cream. Mascarpone also goes rather well in this too, given its similar to cream flavour. Cranachan is a very traditional Scottish dessert made with a couple of quintessentially Scottish ingredients – oats and whisky. Put aside 24 raspberries and crush the rest, either with just a potato masher or in a blender/chopper. Using a medium mesh strainer, strain the raspberry puree, to get rid of the seeds. Make sure your strainer is of medium mesh, using a small mesh will take forever! You want the holes just small enough to catch the seeds. Sweeten the puree with the white sugar, to taste. I usually use about 2-3 tsp of sugar, does depend on how sour the raspberries are. Set aside. Whisk/Beat the cream until the soft peak stage. Add the 3 tbsp of honey and whisky and whisk to mix. Don't overbeat the cream, no need to get to the stiff peak stage, just until the honey and whisky and fully incorporated. We're going to layer the dessert, starting with the cream, 3 raspberries per layer, with a total of 2 layers. Finish with a small drizzle of honey. Serve immediately, can be made about 30 minutes ahead. Wow nice dessert. Looks so delicious and so yummy :). I have never heard of this but I love Whiskey! Sign me up! I’m craving some of this delicious looking dessert! I never had cranachan before. I’ve heard about Cranachan before but I never had the chance to try it. It looks pretty cool and yummy tho. interesting to try. not a fan of alcoholic beverages but this one looks too delightful to try. Thank you, it’s a dessert with a touch of whisky. I imagined the oats to balance the taste but reading through your blog, I realized it’s more than just balancing the sweetness. Sounds like a very interesting desert to make and try. 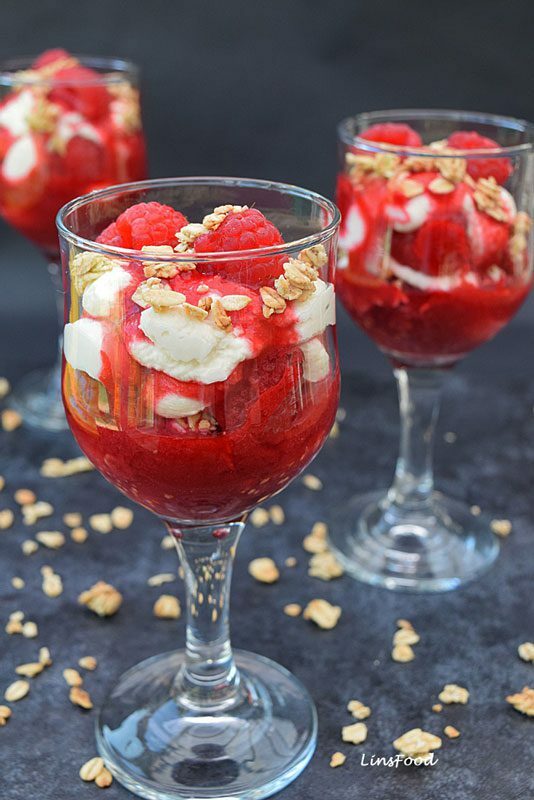 My goodness, this looks absolutely delicious & mouth watering with those raspberries that adds special attraction to any recipe. I am not a fan of whisky, but I would still try this recipe leaving it apart! I’ve never heard or tried Cranachan before. It looks delicious and now I need to make it! That looks delicious! It seems easy enough that even I could do it! That’s my first to hear of it. It presents itself so lovely though! This looks delicious and refreshing. I bet the raspberries make it really sweet. You had me at raspberries and whisky. This looks so good! I have never heard of these before but they look amazing. I will have to pick the stuff up for them and make them for dessert one night for my husband and I. It sounds amazing!!! I am not big fan of whisky but I would be willing to try it! Oh my goodness! This is my kind of recipe! I am totally making this for my husband and myself! Those look amazing! I need to try one of these soon. These would be perfect for my husband and I.
I would love to keep the recipe, it’s not only perfect for beating the heat but it’s also perfect for when you have your girlfriends over. It’s quite easy to do as well and I love raspberries! That sounds refreshing! I don’t normally drink whisky and it’s not an alcoholic beverage that I prefer but this sounds like the perfect drink to have during the summer. It sounds great, I am not big fan of whisky but my husband would love it! Omg!! That looks delicious! My husband will love this dessert, especially the whisky part hahaha. This looks amazing – like having the best of both worlds. I can’t wait to try it!